At least three times a week during the summer, I find myself ripped from sleep, wide awake listening to the local coyotes report in. At times the calls are song like and dreamy and other times they sound downright creepy and alien. While they sound like they are right outside I never get up to investigate, I just wait for the meeting to end so I can go back to sleep. If I gathered all the people in the Boulder County area losing sleep because of coyotes I could probably fill a football stadium. In many communities around Colorado, especially the Front Range, people are not only dealing with the noise at night but also with the conflicts that arise when people and coyotes share space. Coyotes catapulted into the headlines this summer when multiple children were injured in Broomfield. They have also catapulted into many of our individual lives as they use Boulder neighborhoods to forage, travel, and live. Neighbors have lost cats and dogs and have struggled to figure out how best to live with what may seem like a brand new variable in their lives. The coyote issue is a divisive one. Many people probably just want to do the right thing for the animals while still being able to protect their pets and maintain a reasonable sense of safety. There are also other, sometimes louder, voices that call for lethal population control. Then, still there are other, sometimes equally loud, voices who want to protect them at all costs as “they were here first.” In some communities, this is countered by “no WE were here first; I’ve never had a problem with a coyote until recently…” Like a lot of species of wildlife we live with it doesn’t matter who was here first, what matters is that we’re all here now and I don’t think anyone is going anywhere. The coyote issue also does not have a ready solution. Many of the challenges we are facing in the urban interface are relatively new and while we’ve seen some coyote conflicts decrease in certain areas we have yet to find a concrete fix. As an agency we manage wildlife in urban areas as best we can with the tools we’ve got and we make a lot of tough decisions while trying to reasonably protect public safety. We look to studies that have been done and are hopeful about studies to come including a local one headed by Stewart Breck from CSU. Most importantly, we absolutely depend on members of the community whether they want to see coyotes protected or don’t want to see coyotes at all (or both) to do what’s right. Don’t feed wildlife. Don’t feed the coyotes directly by leaving food out for them or offering food from your hand. It may be neat to have a coyote eat out of your hand but if you think you are helping them you’re not — hand feeding coyotes leads to people being bit and the coyote being put down. You are, in essence, killing that coyote. Don’t feed them indirectly by feeding the squirrels or rabbits or foxes that will then serve as a meal for the coyotes. Be cognizant of your property and its wildlife attractants. There is nowhere in Boulder where you don’t have to consider your garbage, apple trees, pet food, barbeque grills, vegetable gardens, and water features as invitations to all wildlife, not just deer and foxes but also lions, bears, and coyotes. Whether you are feeding them on purpose or inadvertently you are teaching them that there is food to be found in the city, next to houses, by schools, and in your yard. Protect your pets. Coyotes can jump six foot fences, can learn that some pets are let out into a yard alone every night, and will prey on cats and dogs of all sizes. Go with your dog outside and put it on a leash. Keep cats inside. If you have to leave your pet outside alone, leave it in a fully enclosed kennel (e.g. with a roof). I have observed firsthand a coyote or coyotes go from preying on loose cats in a neighborhood to, in that same neighborhood, systematically and routinely patrolling the split rail fences along back yards waiting for dogs to be let out. Don’t teach the coyotes that your and your neighbor’s pets are easy targets. Haze coyotes when you see them. It is so hard to go against what we’ve been taught our whole lives. “Don’t harass wildlife” is still sage advice and I do not advocate harassment, but as coyotes are such astute learners the best thing you can teach them is to be afraid of people and houses. If you see a coyote in a neighborhood in the city, scare it away. Yell, use an air horn, spray it with your garden hose, throw small stones in its direction (the goal being to scare not to injure), shake a pop can with pennies in it, or whatever you are comfortable with. 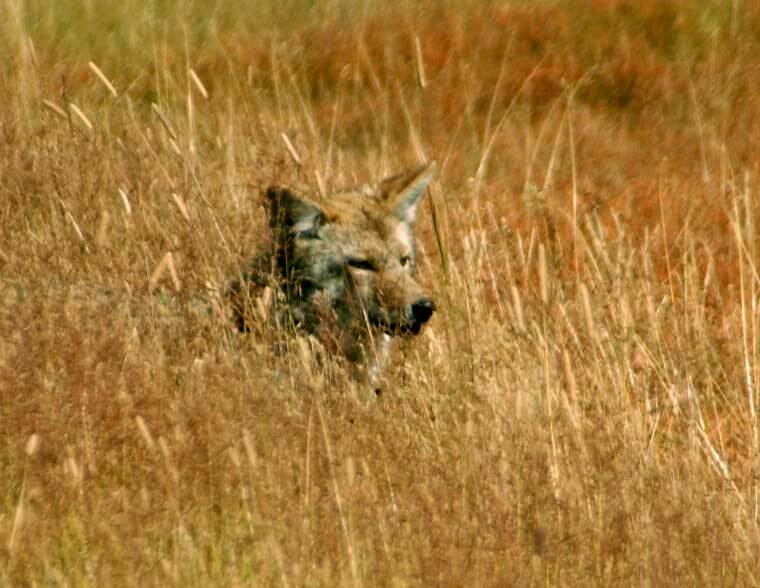 Also, haze the coyote if you see it on open space close to a trail or getting too close to people. Don’t just watch the coyote running down the street with your mouth open wondering “is that a…?” If you can, you should do something. Most conflicts with coyotes are a result of too many benefits and not any costs associated with approaching houses and people. When food is easily available in neighborhood yards and nothing bad or dangerous ever happens in those yards then that’s where the coyotes will go. The solution, then, is not killing or removing a coyote that is behaving naturally (especially considering that the next coyote will behave the same way, and the one after that). The solution is to remove any benefit and increase the cost so that coyotes will instinctively stay away. Coyotes are the most adaptable species of wildlife I know about. Historically, when other predators were successfully or nearly extirpated coyotes remained. During this time of increasing development and loss of habitat, coyotes are finding a way to survive. Throughout a time when many species’ ranges have shrunk, coyotes have expanded their range. Much like humans they have found a way to live in nearly every habitat in Colorado from Kit Carson to Breckenridge to downtown Denver. You absolutely have to admire how they have survived and adjusted and learned. It’s that intelligence and adaptability that have led to conflicts when they learn to lose their fear of people and are rewarded with the food that we provide. Hopefully, our intelligence will help us adapt to our habitat in a way that we can both learn how best to thrive together for a long time to come. 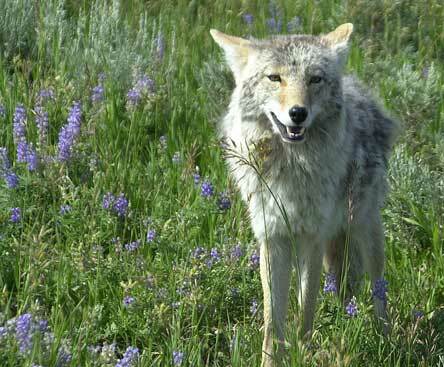 More information on coyotes can be found at the Colorado Division of Wildlife website.